"Politics should not be mixed with sport". "This is sport and we have to respect each other. We fight on the mat and we shake hands off the mat." These are the inspirational words from Russian wrestler Davit Chakvetadze, who just beat the Ukrainian Zhan Beleniuk in the final of men's 85kg Greco Roman wrestling at the Rio Olympics -- and who is the first Russian the crowds have embraced at a Games where the drug-tainted Russian team has been roundly booed. Russia and Ukraine, as we all know, have been engaged in ongoing conflict since the Russian military invention in 2014. 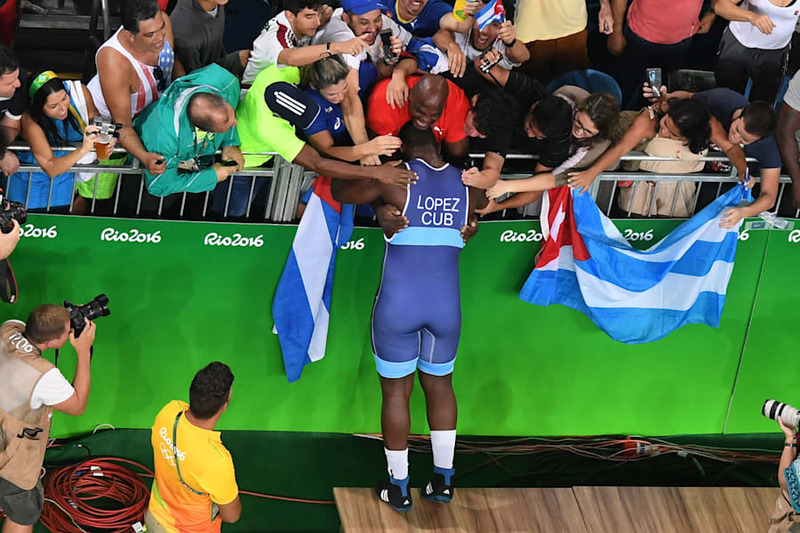 But none of that mattered at the wrestling in Rio. And afterwards, Chakvetadze had a message which should echo throughout the world. "Politics should not be mixed with sport." 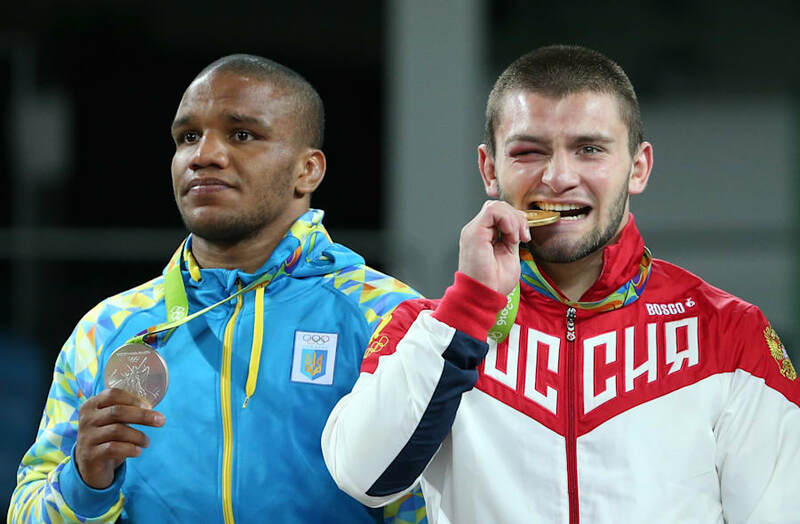 The Ukrainian didn't look too happy on the dais, but relations between the two teams are good here in Rio. In the bowels of the Carioca 2 Arena in Rio's Parque Olimpico, the mood was similar. This reporter spoke to a Ukrainian official who declined to be named, but who said that Russians and Ukrainians are "brothers". "The war is between politicians," he said. "The people, we are friends." Your correspondent was at the wrestling because there's not been much happening in the world of Aussie Olympians over the last 24 hours. Our Hockeyroos got eliminated by New Zealand in the quarter finals, which let's face it, is nearly as unpalatable as a Ukrainian losing to a Russian. Meanwhile our sailors had their final few races for medals postponed due to lack of wind, right before a strong Southerly change blew into Rio in the early evening. So it was wrestling all the way. Why not? It's actually super entertaining. Especially when you see moves like this. We believe this move is called the 'reverse banana'. These guys thought they'd start breakdancing halfway through their match. And if the fancy dance moves don't work, you can always try tickling. Or something a little closer. But if you think the wrestling moves are great, you should see the victory celebrations. It appears to be pretty much compulsory to do some sort of victory boogie. 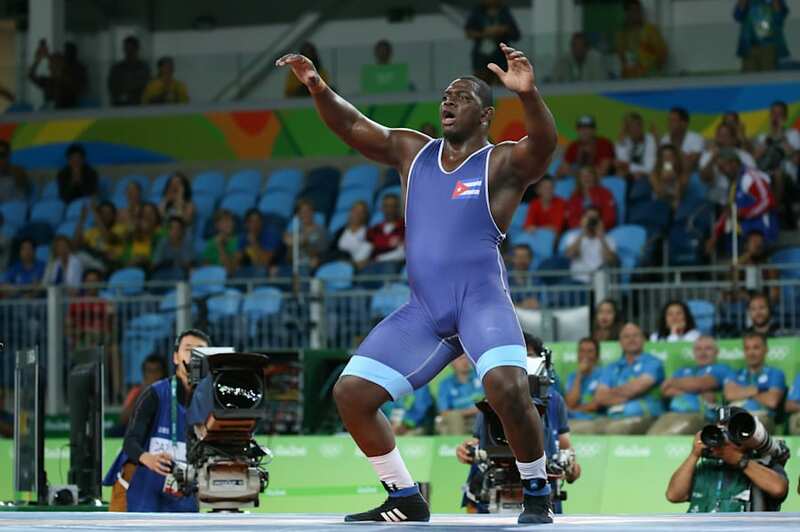 This is Mijain Lopez of Cuba, who just won his third straight Olympic gold in the men's 130 kg division. And because Lopez clearly hadn't spent enough time picking up big men and hurling them around, he thought he'd give it one last go with his coach. He actually flipped his coach onto the mat after this, but we couldn't find a pic of that. Crowds in Rio have been a bit hit and miss. Some venues have been half full, even for finals. But the atmosphere at the wrestling was fantastic. A huge, noisy Cuban contingent was out in force to see Lopez. This guy's like the number one sports celebrity in Cuba. There were also a lot of Germans, who wildly cheered their man Denis Kudla to the bronze medal in the men's 85 kg division. One group in the crowd waved a rare and unusual flag. You can see it in the bottom right hand corner of the pic. The flag is known as the "German Turkish flag". It combines the two nations' flags, and celebrates Germans with a Turkish heritage. But the International Olympic Committee is VERY strict on what flags can and can't be displayed at the Olympics. Only a few flags in addition to national flags are are permitted. Interestingly, one of them is the green-and-gold Aussie boxing kangaroo flag. The flag was taken down shortly after we took this picture. Seems the IOC is also of the view that politics should be mixed with sport. Anyway, good day out seeing men in lycra. Look out for some Aussie medallists tomorrow in kayaking and hopefully some other sports.